Who’s in Your Closet Crochet Mystery Along. Join us for a mystery crochet along beginning July 1st to July 29th, 2014. We have teamed up with Stacey Trock to bring an incredible creature straight to you. You will be so excited once you clue in to what it is. I bet most of you make more than 1. You can get involved at any time but you need to be done your complete project and have a photograph to us by the cut off date. This time, I am going to be updating this article each week with more clues. There will not be multiple pages with each clue. Each Tuesday during the mystery, I will be updating this page with the newest set of instructions and video clips. By the end of this mystery, the entire project will be available to you on this page. Instructions will be given out on July 1st, July 8th & July 15th. Everyone will have until July 29th to submit a finished photograph of their creatures. We were approached by a designer, who I admire personally, Stacey Trock of Fresh Stitches. She asked if she could provide a design for our crochet mystery. Being she is an accomplished designer and amigurumi is her specialty, I said YES YES YES! I have met Stacey in a live show at TNNA in Columbus Ohio a couple years ago. Her gleaming smile is reflective of her personality. You can tell within her patterns and presentation online that she is enthusiastic and wonderful. Crocheted Softies by Stacey Trock. Stacey has three books on the market that are dedicated to super cute amigurmi ideas. Imagine crocheting a one of these creatures as baby’s first plushie. It beats store bought characters. Using Super Saver by Red Heart, choose 1 main colour for the body of the creature. You will use 1 ball, regular 7 oz skein size. You will need two more colours but not a lot of it. I bet you have something in your stash already. You will need 4 sheets of felt. White, Black, Grey and Blue. Sheets don’t need to be very big. Half the size of a standard piece of paper. You can find this at Walmart or other crafting based retailers. Darning/Tapestry Needle to sew your components together. Size 5 mm or Size H Crochet Hook. It’s time for another mystery crochet adventure with Mikey of The Crochet Crowd. We have Red Heart Yarns and Fresh Stitches participating this time around. We have 3 weeks of clues to give you. Each week, will present a new part of the pattern for you to crochet. We welcome you to post your updates on our Facebook to show your mystery projects as the weeks continue. This project has been graciously designed by Stacey Trock, Amigurumi Designer and Author. This is a character that you will fall in love with and kids will be lined up for you to make them one! It’s irresistibly cute! Clue: I’m super adorable and ready to be your best friend. Today, we are going to get you started on the right foot! This pattern doesn’t specify a gauge. It’s a stuffed animal, and you don’t need to be too picky about exact sizing. The most important thing is that you use a hook size that creates a nice looking fabric for your yarn. If you use the recommended hook size, and your fabric looks very loose (so that stuffing would show through), then you will want to use a smaller hook. Other than that, no measuring required! In case you’re curious about getting the exact gauge I do, it’s 5 rounds=2.25 inches. All stitches in this pattern (that are worked in the round) are worked through the back loop only, unless otherwise directed. Refer to Video Tutorial as this is explained. Today’s pattern, we will be focused on the legs. You need to crochet two legs for your character. Remember, keep your stitches into the back loops only unless I tell you otherwise. Rounds 3-4: Sc in each st. (12, 2 rounds) For two of the toes, fasten off. For the third toe, do not fasten off! You will continue to work this toe to join all three together for the foot. Assembly Instruction You may notice holes in between where the toes are joined. Use a scrap of MC and a tapestry needle to close up the gaps. Round 18: Sc next and 4th st together. (1) Fasten off, pulling knot to inside. Make 2. With MC, make a slip knot. Attach with a sc to the front loop of a stitch on round 13 of the foot (first stitch is marked with a red arrow in photo to the right.) Using the front loops of stitches on rounds 10-13, sc a total of 12 stitches in a circle shape, as pictured. Rounds 1-17: Sc in each st. (12, 17 rounds) Fasten off with long tail. 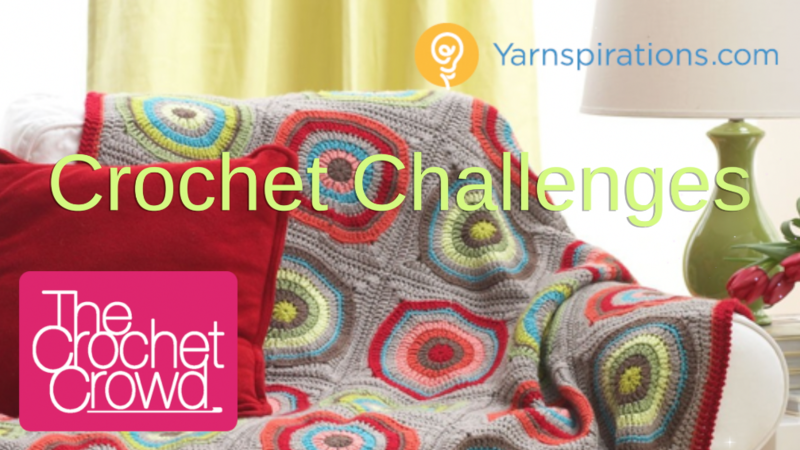 Join us again next week as we explore week 2 of this 3 week crochet mystery! When you get this done, don’t be shy and post a photograph of your finished feet and legs for us to ooooh and ahhhh over your creativity! See you next week. Fun Funny Feet Gallery from our fans. We are not accepting any more photos for this gallery. We are voting to decide the best photo. Thank you to everyone who has submitted. Last week, we started a mystery adventure where crocheters has an opportunity to get started by making the feet and legs. This week, we are moving up the character to create two sets of components. In cooperation with Mikey of The Crochet Crowd, we have Red Heart Yarns and Fresh Stitches participating. Clue: I am determined to learn and explore. In the pecking order of life, I think I am the underdog digging to navigate my way through the sea of life. Today’s pattern, we will be focused on the special nubbly things, hands and arms. Once you have done the feet, mastering the hands are relatively easy as you know what you are doing. Let’s begin. Rounds 3-4: Sc in each st. (12, 2 rounds) Fasten off with long tail. Rounds 3-6: Sc in each st. (12, 4 rounds) For three of the fingers, fasten off. For the fourth finger, do not fasten off! You will continue to work this finger to join all three together for the hand. Don’t fret! You’ve done this part before… it’s just like the feet! The fourth finger hasn’t been used yet. Just set him aside for a few rounds from now. You may notice holes in between where the fingers are joined. Use a scrap of MC and a tapestry needle to close up the gaps. Rounds 18-34: Sc in each st. (12, 17 rounds) Fasten off with long tail. That’s it for this week. Get your hands and arms done to continue to the final clues next week as the mystery will be solved and you will have a loveable and huggable creature. Don’t forget to post your updated pictures on our Facebook page for us to admire your creativity! See you next week! For the past 2 weeks, we have been doing a mystery crochet along. Today, the mystery gets solved and you get to finish off your creature. This week we are doing the main body to wrapping our character up! 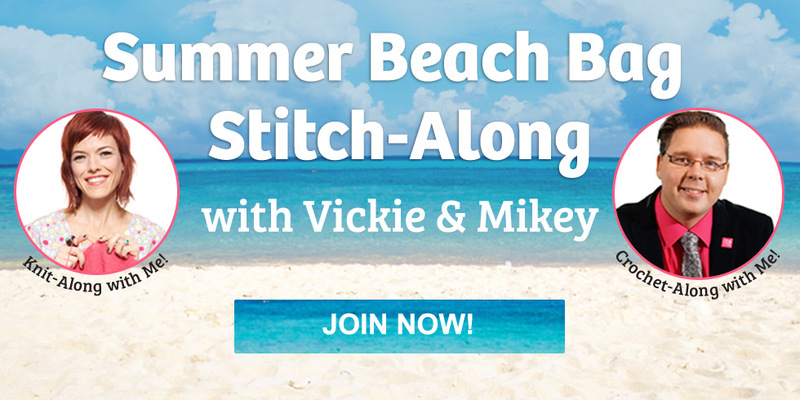 In cooperation with Mikey of The Crochet Crowd, we have Red Heart Yarns and Fresh Stitches participating. You now have two weeks, until July 29th, 2014 to submit a photograph of your finished character to The Crochet Crowd. Go to the submission form at Who’s In Your Closet Mystery to get details. Stacey has a step by step download of this complete pattern available to you. It can be downloaded and printed for your convenience. It’s worth getting this 11 page pattern as Stacey has excellent photography and tips associated to making this character from scratch. Get the Free Download for this pattern. I’m Mike the Monster from Monster University. The following pattern instructions must be completed in the order given so that you can crochet along without any delays. Round 6: *Sc twice in next st, sc in next 4 sts. Repeat from * 5 times. (36) Fasten off with long tail. We Need To Do Assembly Before We Continue to Finish the Body. Stuff behind the eye and attach to rounds 6-15 of body/head. Attach the eye so that it forms an oval-shape (horizontally). Stuff arms. Flatten and attach to round 13 of the body/head. When attaching, note that the opening will be on the bottom of the monster. Stuff legs. Flatten and attach to round 25 of the body/head. Stuff the body/head. Stuff horns. Attach to rounds 6-9 of body/head. Round 33: Sc next and 4th st together. (1) Fasten off, pulling tail to center. I embellished my eye to have all yarn pupils and mouth instead of felt. You are welcome to do that if you wish but there are no instructions for that. I have done the following which can be seen in my Flickr Gallery of the assembly. I added a rim around the complete eye to make the eye appear sunken into the body. I have made my eye out of yarn instead of felt. The mouth has been yarn bombed instead of using felt. I made a Graduation Hat (instructions have been provided). I have provided a Flickr Gallery on how I did it so you can visually see the steps to involved. Using blue felt, cut a circle approximately 1.25” in diameter. Using black felt, cut a circle about .5” in diameter. Using craft glue, glue the black circle to the center of the blue circle. Then, glue that piece to the center of the crocheted eye. Using black felt, cut a smile shape about the 3” wide. This is your time to have fun! Using white felt, cut out teeth shapes. Be creative! I even added a small bit of grey felt to be Mike’s retainer! Glue mouth onto your monster. Congrats! You now have an adorable monster! Thank you for joining us for this mystery crochet along. We’ve had a blast watching you creativity unfold. This pattern will be readily available at any time in the future if you wish to use it and/or follow the tutorials. Let us know what you thought of this mystery crochet along. Would you like to see another mystery in the future? Mikey’s Mike The Monster has a graduation hat. 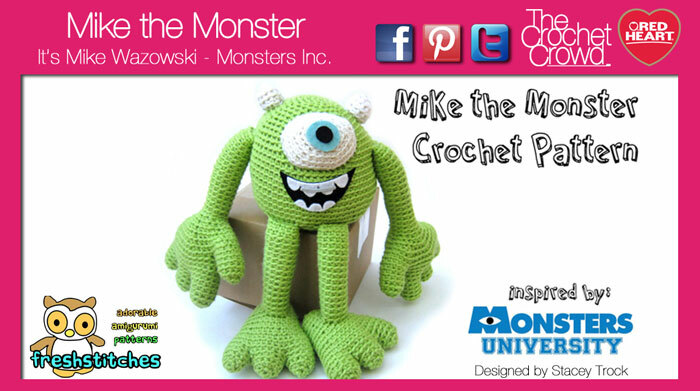 Interested in the free pattern, head on over to The Crochet Crowd to get this free pattern. It’s called the Graduation Hat. Mike The Monster, Graduation Hat Pattern. Graduation Hat not Required for Final of the Challenge Mystery. Stacey Trock has received special permission to design this licensed and trademarked character. The permission has been extended to The Crochet Crowd to teach her pattern for educational purposes only. You may not sell these tutorials and/or the free pattern. It has been designed with the understanding that the pattern remain free to all. This pattern’s creation is for personal use which includes something for yourself and/or giving away as a gift. You may not sell your finished creatures under any circumstances. Copyright, trademark and licensing of this character remains in full effect. Red Heart Yarn Bag with Crochet Crowd Gifts. The project is not as big as the giraffe. The mystery will last for 3 weeks before giving the two week deadline after the 3rd week. July 8th – Next part of the pattern with video will be released. July 15th – Final part of the pattern with video with assembly instructions. July 15th – July 29th, 2014, Crocheters will have until 6 pm, EST on July 29th, 2014 to have their email photos submitted to us. A random draw will take place August 10th, 2014 and will be announced on Facebook and our newsletter. Crocheters must complete the crochet mystery adventure as outlined in the pattern. All components must be completed. Crocheters may embellish their creature at the end, but all components in the pattern must be done. Embellishments can be anything which includes crochet items and/or mixed media. The gallery will be open for submissions starting July 15th, 2014 and close Midnight Eastern Standard Time, July 29th, 2014. We will accept any late submissions after the draw but they will not be eligible for the draw. This is open to all Crocheters on planet earth. The draw is 100% random and will be done on August 10th, 2014. Let’s have fun and find out together who is in the closet. To be included into the challenge, you must provide your full name and address when submitting your character. You have until 11:59 PM, July 29th, 2014 to submit your picture to be eligible for the draw.